Discussion in 'LG' started by vvb8890, Jan 16, 2019. I took a look at the BIOS over the weekend to see what kind of options were present, it's not very extensive at all. Perhaps if you report your findings to support they can consider a BIOS update for compatibility. I also installed Throttlestop to see if I could change the turbo power configuration as well as do some undervolting to see if I could get a higher Cinebench score. It's thermal throttling pretty heavily. I'm going to order some kryonaut so I can reapply TIM. I'll probably install a 2nd SATA SSD while I'm in there since I have a spare one. Unfortunately one of them went belly up over the weekend in a different notebook but I have quite a few lying around. I honestly don't see the difference much between SATA vs NVMe in normal usage, I don't usually copy extremely large amounts of data around quickly. OH, I also did hook up one of my SSD's to a USB cable and copied some data back and forth as well as did an entire disk health scan for bad sectors on two different m.2 SSD's .. I did this while using the included LG adapter. I didn't see any battery drain issues. I did not however have a USB ethernet adapter hooked up draining power. So might not be a valid test. @msintle did you ever end up picking up a thunderbolt dock that has power delivery? So yeah, their support is absolutely useless - they promised to escalate the UEFI BIOS issue, and I've never heard back. I reported the issue weeks ago already. Buyer beware! This product is NOT professionally supported. I'm not surprised you were able to confirm the thermal throttle. At my end, thankfully, I haven't seen 390MHz incidences recently. Today I did a software build which maxes out all CPU cores, and performance was a smooth 2 GHz, almost always above it actually. But I know it will come back randomly and at the most frustrating time possible, that's usually how it goes. This is based on my experience with the Surface Pro 2017 (Pro "5") which exhibited a similar issue. Maybe its an Intel CPU problem, I honestly don't know. Summer is coming...which never helps with these things, does it? Do you have an adapter you might recommend to connect M2 SSDs via USB? I could use one of those. I still see the battery drain every time, but it may be simply because my hub is also attached, and consuming power. On a high note, its great to be able to connect the LG GRAM 17 to 2560x1600 via my hub which sports a mini display port that I further convert into a dual link dvi signal using the powered Apple adapter. I'm sure they also drain a low of power, resulting in or contributing to my scenario. Still, no excuse for not shipping a proper power adapter with the device. The devil is in the details. I haven't yet picked up a thunderbolt dock with power delivery. I checked a few and they were about twice to thrice as expensive as my current dock, which the company may not pay for. The eGPU option is very interesting too. 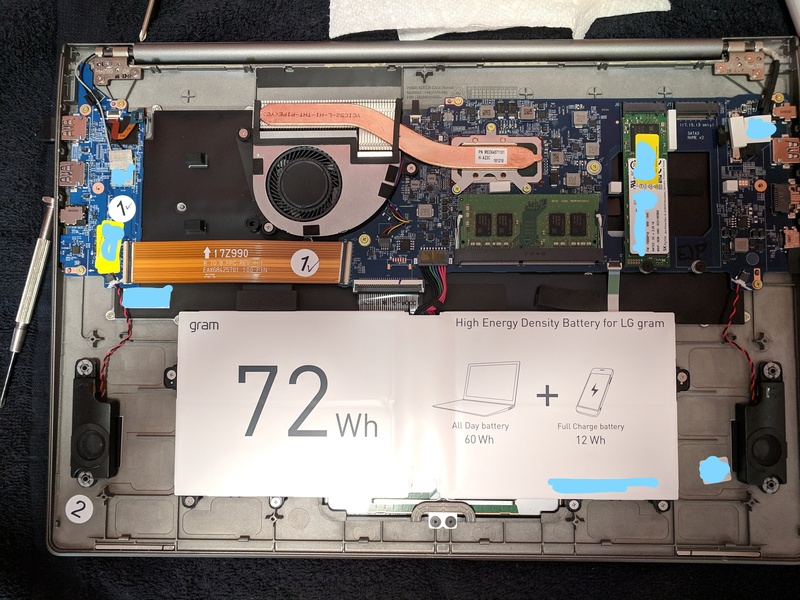 If I had more confidence in the device, it might have even proposed replacing some of our bulky and costly build machines with the LG GRAM 17 and eGPU combinations. Unfortunately I cannot make such a recommendation on good conscience at this time. Maybe if LG fixes their issues? Keeping fingers crossed! 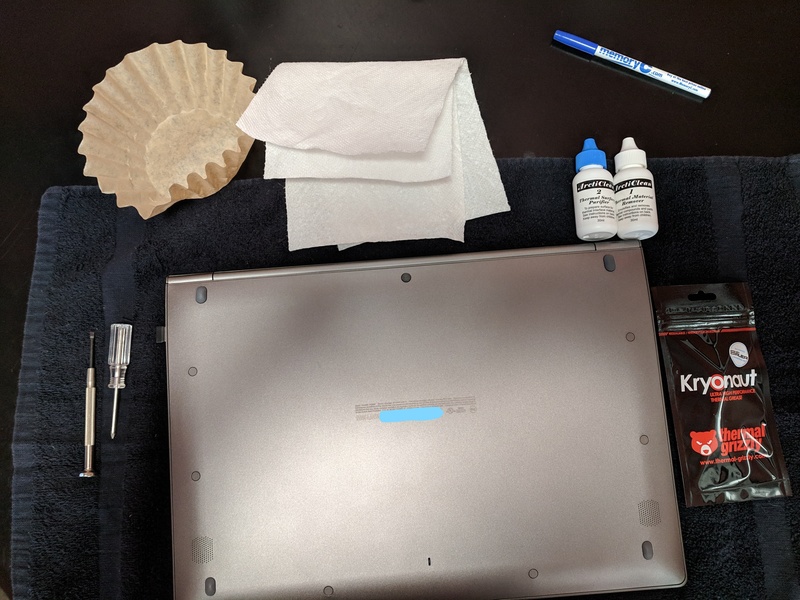 Like I wrote earlier, I was fully ready to fall head over heels in love with this device, and its never too late - provided, of course, they actually fix the stuff they need to! That's a shame. I fully expected it to throttle since I saw a shot of the internals well before I bought it and it has the same exact meager heat management solution that the 15" unit had last year. It's really a shame because there's SO MUCH room in there to just add a small amount more metal surface area to the heatsink and fins and maybe a longer/better heat pipe. It really wouldn't add much weight at all to just put a bit more in there. It wouldn't take much. But I read that applying a good TIM (i'm going to order some kryonaut) fixes it to a decent extent. We'll see. Works well, I only use it intermittently though when I have to restore a backup or copy files around or similar. These are all SATA only, I think recently some company finally released an NVMe USB enclosure, not sure of the quality though. I'm still loving the laptop. I haven't had anything to complain about yet, and I'm pretty much getting used to the keyboard at this point. The weight is awesome, the display is magnificent, and it seems to be working really well with audio production software (cubase and reaper). 1) Fix the UEFI BIOS bugs. This is just crap firmware holding down your existing hardware. 2) Fix the thermals. 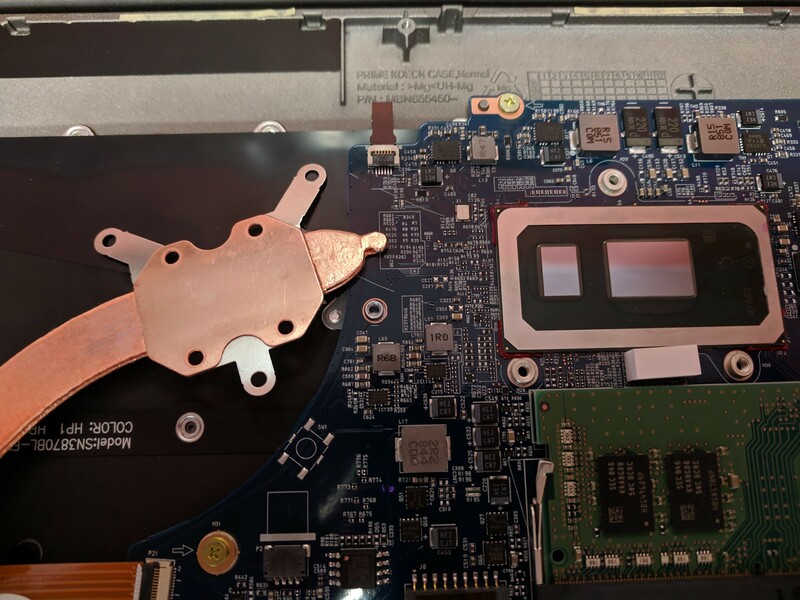 Your 17" device runs slower than a 12" Surface Pro, despite having a WEAKER CPU. 3) Add a touchscreen, preferably with pen support. Lots of devices doing this. Maybe your issue was your 2560x1600 aspect? If so, I'd rather KEEP this aspect than have the touchscreen/pen support, FWIW. 4) Improve support. Just make sure your escalation paths actually get to someone in charge. There's hardly anything more frustrating than a device with issues AND no support. 5) You weren't even allowed to sell LG LW70 in the US market a decade and half ago due to your LCD panel licensing deals. You have a chance now - DON'T BLOW IT! I ordered the Kryonaut, should arrive sometime next week. I'll do a before and after cinebench and load test to see if it can sustain some higher boost clocks afterward. I'm not expecting a miracle, but maybe if I can get some iterative improvement it would be worth it. Quick question - would there be any point to the application, given there's no heatsink? I thought the point of the substance was to increase conductivity, but for that, there has to be a heat recipient...am I not getting something? I applied the Kryonaut. Idle temps dropped a little, but under load not much has changed. It seems to run a tad more stable in repeating slightly higher Cinebench scores if I run them back-to-back consecutively, but it's not any type of drastic improvement at all. The heat pipe/sink assembly in the unit is VERY lightweight. They really need to consider beefing it up just a little for the next iteration of this laptop, it would add NEARLY no weight. I would be able to hold those higher boost clocks a little longer with less saturation of the very weak heat management. I'll try it again in 48-74 hours as temps do tend to drop a couple-few more C after a few days, I don't care what TG says about Kryonaut needing "zero cure" time. I don't expect it to change much though. So, tl;dr doesn't seem to be worth it to bother reapplying the TIM judging by the first hour after application. I'll post again sometime next week after it's had some cure time. A couple pictures I took for anyone interested, I forgot to take a shot of the Kryonaut application to the dies after the cleanup, sorry. I used the included spatula to spread it. Sorry totally forgot to take a shot of the Kryonaut applied.. it's spread onto the dies evenly..
nalim and msintle like this. Hi all. After reading some reviews and following this thread I bought myself a LG Gram 17. As I live in Europe where it is not available and auctioneers want a hefty premium to get it shipped from the US I decided to instead import one from Korea. As I read about the overheating issues I decided to save a few bucks and got the i5-8265U model in white: 17ZD990-VX50K. This comes without windows and with only 8 gigs of ram and a 256 gb ssd. Fortunately the 8gbs turned out to be single slot on board, so I can easily upgrade to 16 gb. The sata ssd also had to go anyways and was replaced by a samsung evo plus 970 nvme drive. I see none of the big problems msintle had, but I'm only using the x4 nvme slot. It took me a while to figure out how to get LGs drivers on my model (turns out it requires LG DnA Centre instead of LG Update Centre), but in the process I saw there was a recent BIOS update that might have solved a few issues already. I did some stress tests and that's where things get interesting. I used the AIDA64 stress test and thermal throttling happens a lot! Almost immediately I got 43% throttling. The problem seems to be caused by multiple issues unfortunately, but I'm sure some improvements can be achieved. First I did some undervolting using Throttlestop. I'm happy to report that my cpu/cache/system agent run stable at -110 mv and this reduces throttling quite a bit. During the stress test on all cores, the cpu now runs at almost 3.0 GHz instead of 2.5 GHz before. Definitely mediocre is the fan control. The fan just doesn't spin up soon enough.. once heavy load starts, the 90 degree limit (which is quite low) is hit in like 3 seconds and the fan takes about 5 secs to finally spin up. We definitely need a way to control this fan to improve performance. The LG Control Center I found only has the option to shut the fan down completely, which is absolutely useless. 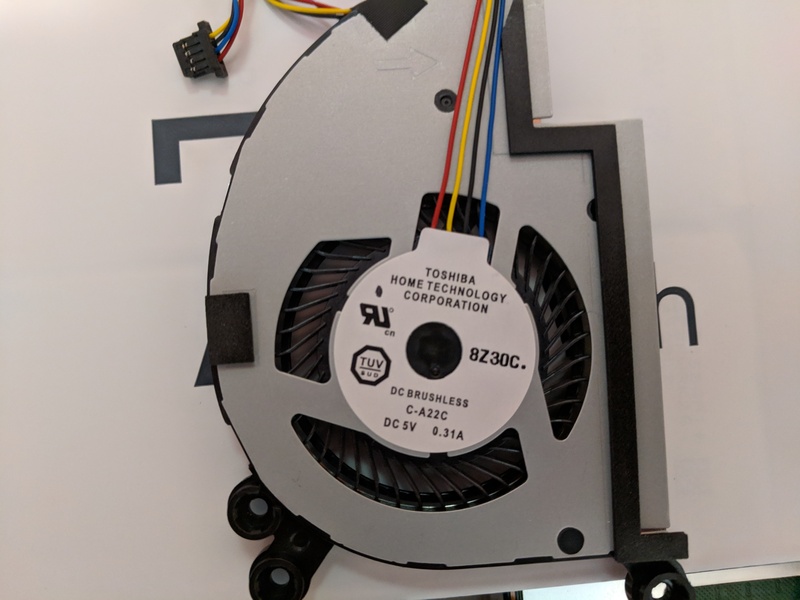 Did any of you find a tool that can control the fan? 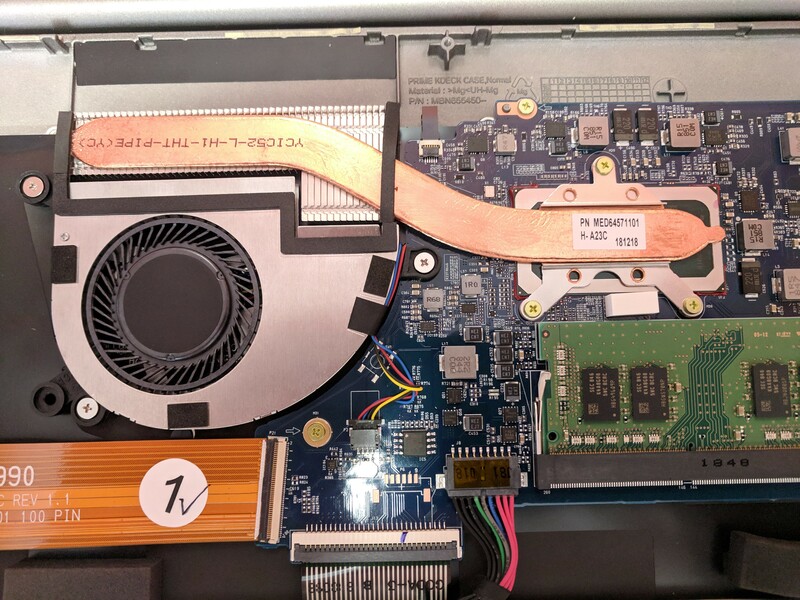 I will attempt to find a Notebook Fan Control config at some point, but maybe there is a tool buried somewhere in a Korean forum? Unfortunately I don't understand the language. This is great news! I tried undervolting with throttlestop with -80mv on both core and cache and it didn't seem to change anything at all for me for sustaining boost clocks, this is even with a better quality TIM. In fact I think I might have been experiencing some slight instability with those settings so I disabled the task scheduler startup I had created for it. Maybe I'll try again only uv'ing the core and leave the cache alone and see if that changes anything. But again, it didn't really seem to help the throttling. It seemed like it was more power limit throttling than thermal throttling. I tried adjusting the TPL settings as well to let it boost longer at a higher wattage but it didn't seem to make any difference it still slowly worked it's way back down to consuming 15W. What is this LG DnA Centre? I can't even seem to find it on their site, but it seems much like LG Update Center for the US model. This page seems to have a warning that DNA Center is only for certain models: https://www.lg.com/uk/support/product-help/CT30007240-20150925983430-others. I have not noticed any BIOS update for my unit being downloaded by their software, it did install quite a few updates when I first was setting it up and it did install brand new audio drivers with a new control panel for that the other day. So it seems to be working as expected. I'm intrigued by you being able to sustain some higher boost clocks, as well I wish the white unit was available here in the US it looks pretty nice. Congrats on getting a good one! I went from -80mv on core/cache to -125mv on the core and no offset on cache and it seemed to sustain boost longer, but it still eventually got back to 15W. Repeated runs still give the same result as before. It would be nice to have a fan control option to just force it to full if you wanted, honestly I can't even hear it over ambient noise when it is running full bore anyway. The LG DnA Centre is probably for those korean models that don't ship with Windows. It's just a little tool which downloads updates. I found it on the korean site using google translate. It installed things like LG control center for me. The problem was that I could not install LG update center because the installer told me "this model is not supported". I will look up the precise bios version tomorrow, but mine for sure is newer than yours, it is from Jan 2019 and my unit was manufactured in march 2019. I tried undervolting to -120 mv and it seemed stable for a while, but then I got a blue screen and after that, I went back to -110 mv which is fine up to now. I do think we absolutely need to get fan control somehow as the behavior in stock form is ridiculous. The fan reacts so sluggishly that heavy throttling occurs before the fan even starts spinning . We need to be able to make it start earlier and faster to improve performance. 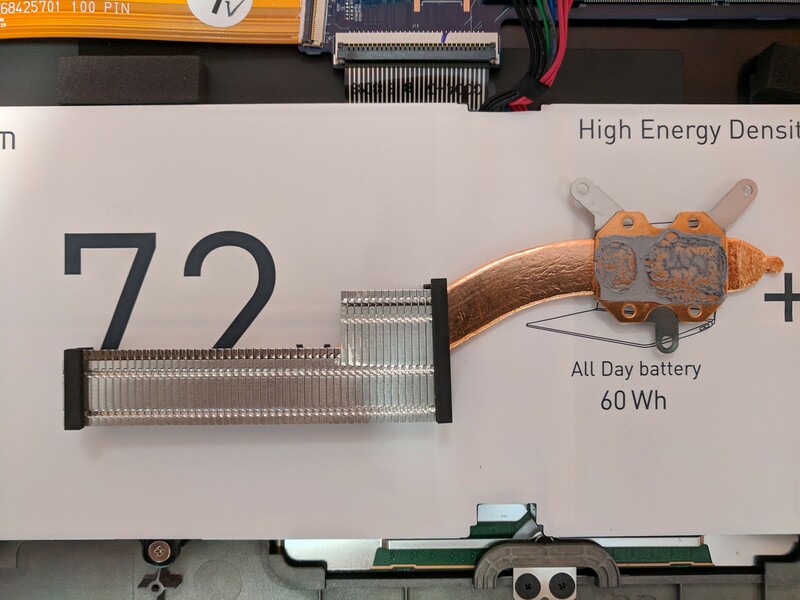 It looks like they got a little bit too much inspiration from apple when it comes to setting the temp threshold for the fan. 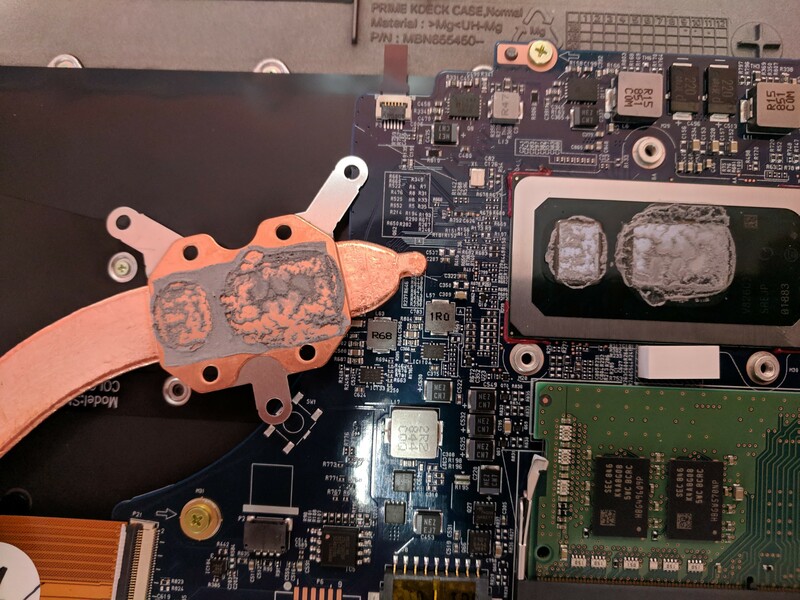 I will probably apply liquid metal tim at some point and will also install an additional heatpipe on top of the built-in one. I'll share pictures in case this helps (it's reversible and I had good results on other laptops before). I also see power throttling, but I do see thermal throttling as well (especially when using prime95). On a huawei matebook x pro it's possible to work around power throttling by disabling the intel thermal framework, but I won't even attempt this on the gram as long as temps are this high. hfm and msintle like this.